The still lifes of the Old Masters have always fascinated me and I occasionally do them in batik. I especially like to play with the colors and the fabric folds in the background and table coverings. This is a subject matter I would like to pursue further. Landscapes allow me to experiment in perspective, atmosphere, texture, and composition. I am fascinated with the complexity of the rules of composition and color temperatures to create moods and emotions. The skies of Montana are beautiful and a constant source of inspiration. 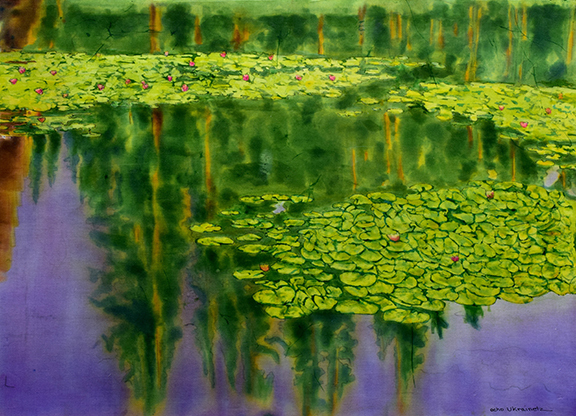 Seeley Lake, Montana, is a great location for water lily reference, which is a favorite subject of mine but water lilies are quite a challenge in batik. The reflections must be done with soft edges, gently overlapping. The distant lilies need to have definition but not detail. The lilies in the foreground need to have more detailed definition. Each step is a distinct technique.